The WOW VPN service allows you to reliably route your internet traffic via the WOW VPN servers based in the UK. Follow this guide to easily setup a WOW VPN connection using a Google Android device. Under 'Settings' select 'Wireless & Network'. 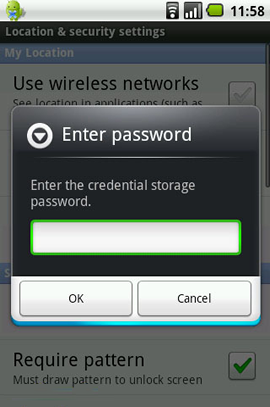 Next confirm add with storage password. This is your Android device password not your WOW VPN password. Now you have configured your VPN. Click on WOW VPN to connect. 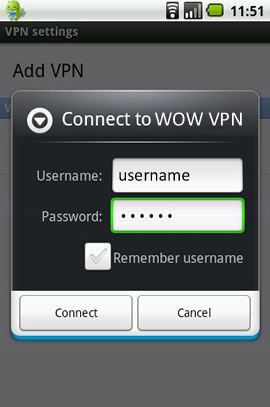 Now add your WOW VPN username & password. Once you make a successful connection, you will see a key icon in your notification area indicating you are connected to WOW VPN. Now that you know you can make the connection, you can disconnect by pulling down your notification drawer, tapping the VPN connection, and then tapping the VPN connection name to disconnect.